Gallstones are common in the United States, especially among the Hispanic population. They are common among the fatty fertile females in their forties. The gallstones are mostly asymptomatic that do not need treatment except in certain high-risk groups. The symptomatic patients present with right upper quadrant abdominal pain and cholecystectomy is the primary treatment option in these patients. 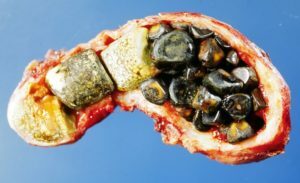 What word best describes the process by which gallstones are formed?